Happy Post-Memorial Day! I hope everyone had a wonderful day and enjoyed the beautiful weather! 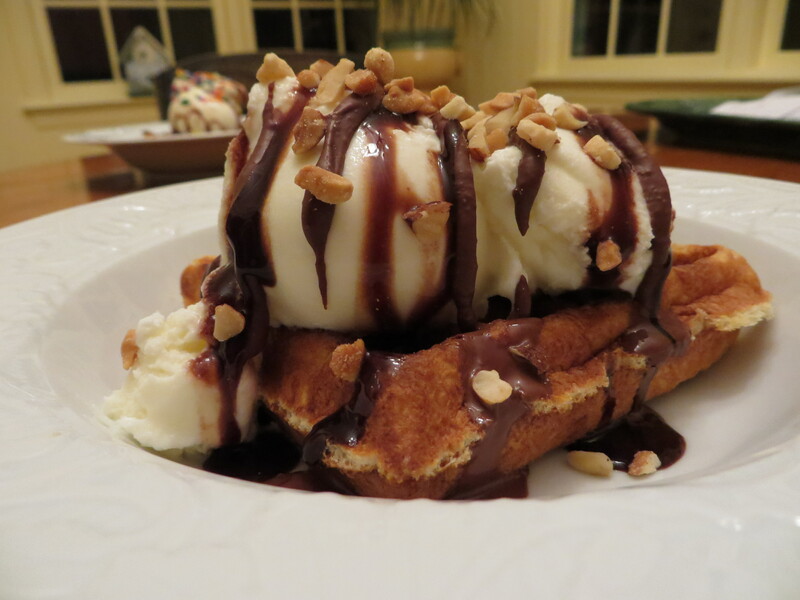 With the weather this weekend pushing into the 80s, I had the urge to break out the ice cream maker and whip up something for Memorial Day dessert. Since we are in the midst of cleaning up the yard for our graduation party, a cold treat was more appealing than cake, pie, or cookies. BUT, since we were hauling pavers, reseeding the lawn, planting bushes, etc., heavy ice cream was not appealing either. Watching morning cooking shows with my mom led to me to Pioneer Woman’s Cherry-Pomegranate Sherbet… and the dessert decision was made. 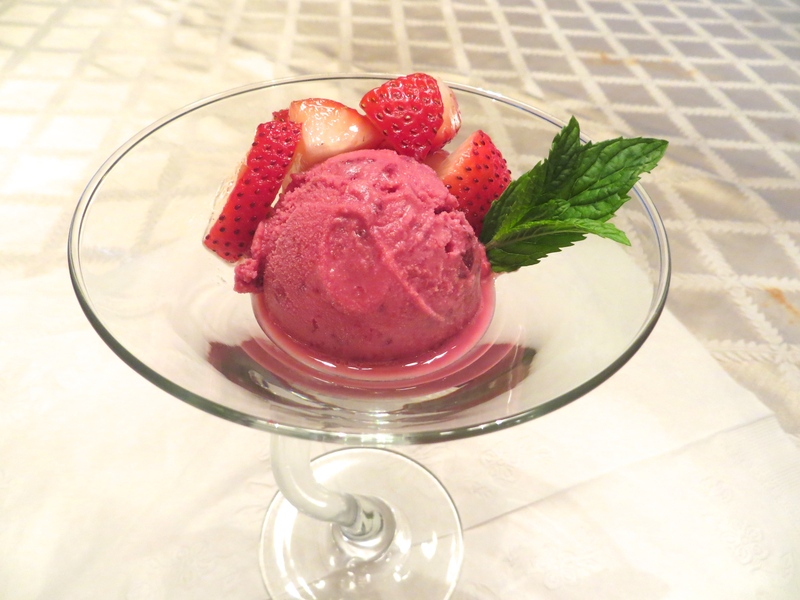 However you pronounce it, this is an adaptation of PW’s Cherry-Pomegranate Sherbet. In a saucepan, combine cherries (I used pitted, frozen ones), granulated sugar, and pomegranate juice and bring them to a medium boil. Let it slowly boil (or heavily simmer, you’re choice!) for about 10-15 minutes until the cherries soften. 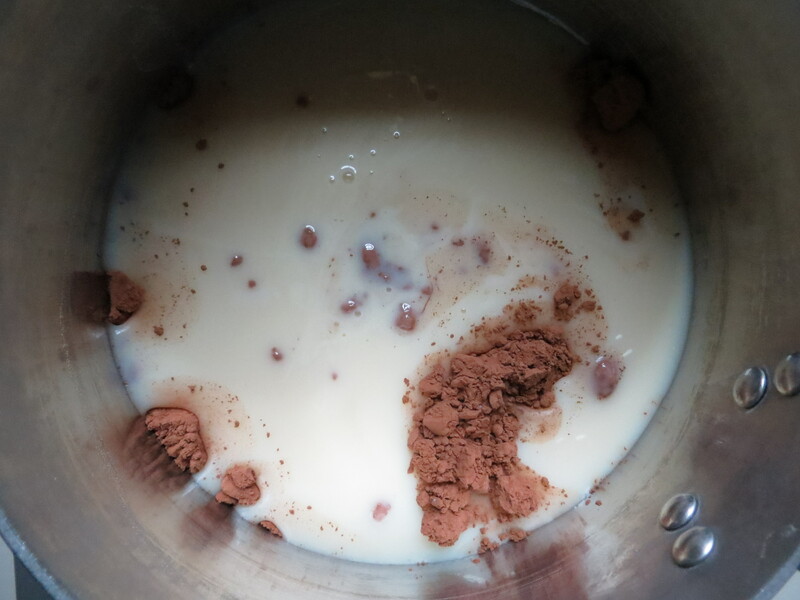 Then you need to let the mixture cool to room temperature before moving forward – this mixture is sticky and hot and I would be devastated if you burnt yourself! And since I am spacey, let’s pretend that there is a picture of me pureeing the cooled cherries and their juices in a food processor with the juice of one lemon. You can puree until very smooth if you wish, but I left mine a little chunky (because I love chunks of stuff in my ice cream!). Where I deviate from PW’s recipe is that I used skim milk and fat-free half-and-half instead of whole milk and cream. Pour the sherbet base into your ice cream maker and freeze to your manufacturer’s instructions. My churn takes about 20 minutes to freeze a quart of ice cream/sherbet/sorbet. When the sherbet is completely frozen, pour into a quart container and freeze for at least 24 hours. And look how cute this container is! It reminds me of the little ice cream shops that hand-pack their quarts of ice cream. But the tart combination of cherries and pomegranate cries for a little something sweet to go on top. So, in honor of my mom’s friend who actually got the cherries for us, I decided to make a sherbet sundae and name it after her. It is super simple to make but packs a big, flavorful punch by balancing the tart sherbet with a sweet (and boozy) topping. To make the topping, place a pint of sliced fresh strawberries in a bowl. Add one tablespoon of sugar (or more if your strawberries aren’t sweet enough) and one shot of good vodka – stir to combine. Let the berries sit for at least 15 minutes (but 45 minutes to an hour would be better). To serve, scoop some of the cherry-pomegranate sherbet into a martini glass (or a bowl), add some of the macerated strawberries, and garnish with some mint. Yum! If you want a kiddo-friendly version, just leave out the vodka and puree the strawberries until a smooth sauce forms (I like this just as much!). 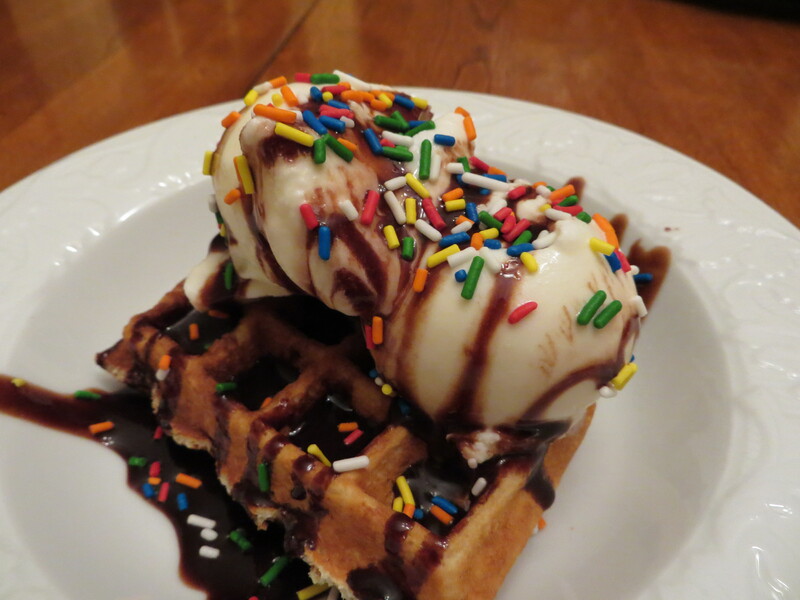 I hope you enjoy this wonderful summer treat! Check out the handy dandy printables at the bottom! 1. Place ice cream maker core in freezer at least 24 hours before making (in the summer, I keep it in there all the time). 2. In a medium saucepan, place cherries, sugar, and pomegranate juice. Bring to a slow boil and let cook for 10-15 minutes, or until the cherries are soft. Let mixture cool to room temperature before proceeding. 3. In a food processor or blender, place juice of one lemon and the cooled cherry mixture. Puree until you reach a smooth consistency (but you can leave some cherry flecks in there if you want!). 4. Add in the half-and-half and the skim milk. Pulse to combine. 5. Freeze the sherbet according to your ice cream maker’s instructions. 6. Place frozen sherbet in a quart container and freeze for at least 24 hours. 7. Serve by itself or as a Blushing Dorothy! 1. Place strawberries, vodka, and sugar in a bowl – stir to thoroughly combine. Let sit for at least 15 minutes, but they do get better the longer they sit (45 minutes to 1 hour). 2. Place one scoop of cherry-pomegranate sherbet in a martini glass, top with some of the strawberries and their juice, and garnish with fresh mint! Note: If you want to make this kiddo-friendly, just leave out the vodka and drizzle with a little bit of dark chocolate sauce!